In 2005 most of the new EU member states (NMS) performed even better than in 2004. They have successfully managed the accession to the EU and gained the ability to grow fast despite the anaemic performance of the old EU. FDI inflows reached a record high. In the coming two years, economic prospects for the NMS are fairly good, even if growth in the old EU remains unimpressive and prices of energy stay high. By 2007 higher EU transfers should be allowing for a significant expansion of investment. The positive contribution of net exports to GDP growth is expected to continue in 2006-2007. Besides, rising private consumption and investment should be playing a stronger role than in 2005. With continuing appreciation of the domestic currencies, the exchange-rate adjusted unit labour costs are growing, as yet without adversely affecting exports. This is a sign of success of the ongoing restructuring of the industrial sector. Interestingly, employment, also in industry, rose in 2005 (except in Hungary). Inflation slowed down to very low levels and is no longer a serious problem. Hungary and Slovakia will have to start consolidating their public finances. In both countries the consolidations may be postponed to 2007 for political reasons. 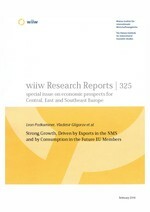 In Southeast Europe, growth has on average remained strong, though it has come down in Romania and Serbia. Rising consumption was the main contributor to GDP growth in this region. That was partly the consequence of the increased soundness of the banking system, but also of the improved expectations of growth in the short and medium term. In the next two years growth should continue, though the volatility is still significant and there are also short-term policy measures that could slow down the recovery. An expectation is that significant inflows of foreign investments will start to translate into growing industrial production, which has been lagging behind in the past. Also, employment is still declining, though unemployment rates have stabilized. Exports of goods and services grew strongly throughout the region, while imports expanded even faster in Romania, Bulgaria and Albania. Price stability and fiscal balance have mostly been preserved, except in the case of Serbia, which has seen accelerating inflation, and Romania, where disinflation has been interrupted. The downside to that is a growing concern that credit expansion is threatening the external balance and price stability. Thus, the region is still facing policy challenges and that adds to the volatility rather than sustainability of its growth prospects. Russia's GDP increased by about 6% in 2005. The main driver of growth was rising domestic demand while the contribution of real net exports to GDP growth was again negative. The pace of structural reforms has slowed down substantially and state interventions in the economy are increasing. GDP growth of about 6% is forecast for the coming years, disinflation will be slow. Sustainable and broader-based long-term growth would require more investment and economic restructuring. The slowdown of economic growth in Ukraine has been spectacular, reflecting weak investment demand and the deterioration of foreign trade. By and large, the country's economy remains hostage to the political uncertainty ahead of the parliamentary elections in March 2006. In China, GDP grew by nearly 10% driven by both external and domestic demand. A slight growth deceleration is expected for 2006-2007 as the government intends to slow down investment expansion and as exports of some products to the USA and the EU will be restricted.